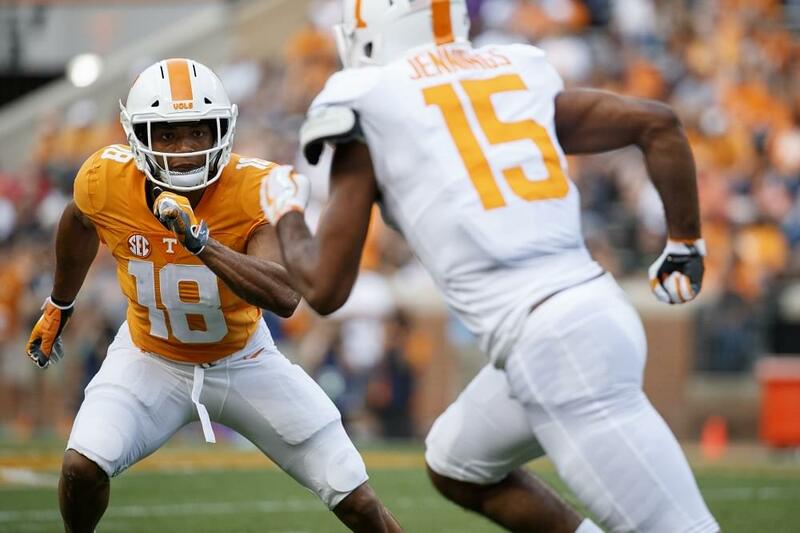 KNOXVILLE, Tenn. – After a victory over Charlotte on Homecoming last week, Tennessee jumps back into Southeastern Conference play this Saturday as No. 11 Kentucky visits Neyland Stadium. Kickoff for the game is set for 3:30 p.m. on the SEC Network. 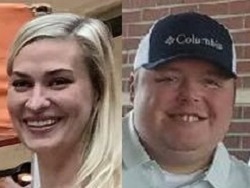 John Congemi (play-by-play) and Taylor Zarzour (analyst) will have the call with Kris Budden reporting from the sidelines. Vol Network radio affiliates will have a live audio broadcast with Bob Kesling, Tim Priest and Brent Hubbs. Sirius (Channel 135) and XM satellite radio (Channel 210) will also carry the game. Saturday is the start of the home stretch of the regular season for the Vols, who will play their next two games at home before capping off the regular season with a road contest against in-state rival Vanderbilt. UT needs to win two of its final three games to become bowl eligible. Tennessee and Kentucky will meet for the 114th time on Saturday afternoon. The Vols lead the all-time series with a 79-25-9 record, including a 42-10-6 mark in Knoxville. UT has played and beaten UK more than any other team in program history. The two programs first met on the gridiron way back in 1893. The Big Orange have not lost to the Wildcats at home since 1984 and are 16-0 in that span. Kentucky came away victorious, 29-26, in last season’s meeting in Lexington to snap a five-game losing streak in the series. 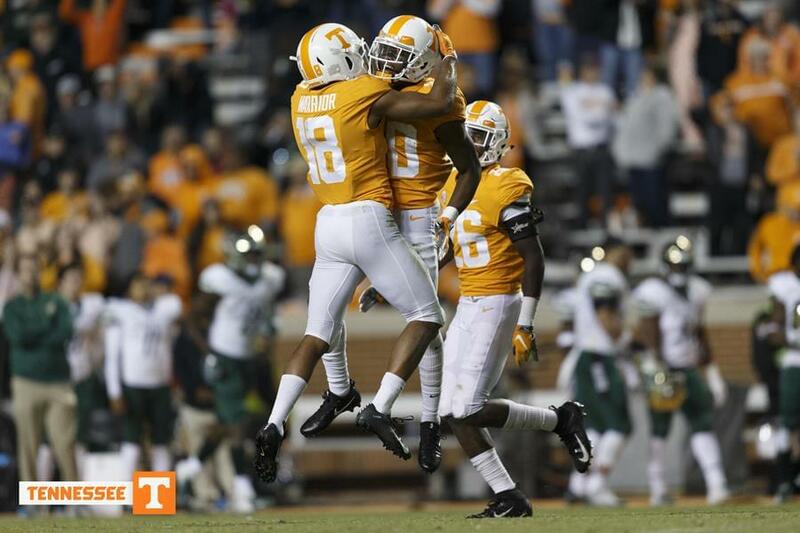 Tennessee boasts one of the better wide receiver trios in the SEC in Josh Palmer, Marquez Callaway and Jauan Jennings. The three have combined for 74 receptions, 1,151 receiving yards and six total touchdowns. Palmer, a sophomore from Brampton, Ontario, Canada, leads the team with 414 receiving yards and has been a big-play threat for the Vols, averaging 23.0 yards per catch, which ranks second in the nation. Callaway paces the unit with a career-high 30 catches to go along with 402 receiving yards. The junior is also dangerous on punt returns, as seen last week with an 82-yard punt-return touchdown, the second of his career. Jennings is tied for the team lead with three receiving touchdowns and ranks second on the squad with 26 catches this season after missing basically all of 2017 with a wrist injury suffered in the season opener. The Vols have been much improved on defense this season and senior defensive end Kyle Phillips has played a major role in that success. Phillips is having a breakout year for the Orange and White, having already set career highs with 37 tackles, five tackles for loss, three sacks and four passes defensed. The Nashville native has also forced and recovered a fumble this year and returned an interception for a touchdown against No. 1 Alabama. In last weekend’s win over Charlotte, Phillips tied career highs with two tackles for loss, a sack and two pass breakups. 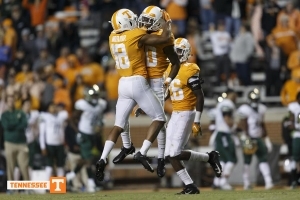 The duo of Alontae Taylor and Bryce Thompson has impressed at cornerback this season for UT. Taylor and Thompson are the only pair of true freshmen in the SEC to start a game together at corner this season, doing so four times now. Thompson leads the team and ranks second in the SEC with three interceptions and has been named to the PFF College SEC Defensive Team of the Week three times this season. His three picks are tied for the most by a Tennessee true freshman since Eric Berry had five in 2007. Taylor leads the team with two forced fumbles and recovered a fumble in the end zone for a touchdown in UT’s upset victory at No. 21 Auburn a few weeks ago. He’s also racked up 27 tackles and has blocked a punt this year. Tennessee’s defense has shown significant improvement this season under first-year head coach Jeremy Pruitt. The Vols are on pace to better their defensive statistics in nearly every major category this season. The Big Orange have held three opponents without a touchdown this year (ETSU, UTEP, Charlotte), marking the first time since 2008 that the Vols have accomplished that feat. Tennessee has also scored three defensive touchdowns this season, which is tied for seventh in the FBS. The Vols will honor military members for its annual Salute to Service game on Saturday. Planned moments during the game include a half-time performance by the Marine Drill Team, veteran Jim Cundall being honored as the Volunteer of the Game and a recognition of Gold Star families pregame. A flyover performed by the 134th Air Refueling Wing, a unit of the Tennessee Air National Guard stationed at McGhee Tyson, will also take place at the end of the National Anthem depending on weather conditions. Kentucky is having one of its best seasons in program history, entering Saturday’s game with a 7-2 record, it’s best nine-game start to a season since 1984. Sitting at 5-2 in conference play, the Wildcats have clinched a winning record in SEC play for the first time since 1977 and have already assured themselves a second-place finish in the SEC East. They are ranked in all three major polls (No. 11 CFP, No. 12 AP & Coaches) and are looking to reach the eight-win mark for just the fourth time in the past 57 years. Kentucky is led by a dominant defense and powerful running game. UK ranks eighth in the country in scoring defense (15.3 ppg) and 15th nationally and fourth in the SEC in total defense (311.8 ypg). The Wildcats are coming off a 34-17 loss to Georgia last week, which was the first time all season they had allowed more than 20 points in a game. The defense is led by senior linebacker Josh Allen, who is the SEC leader with 10.0 sacks, 14.5 tackles for loss and five forced fumbles. Senior safety Darius West leads the secondary with three interceptions and six pass breakups. Junior running back Benny Snell Jr. has been the heart and soul of the Kentucky offense this season, ranking first in the SEC with 1,008 rushing yards. The workhorse back has also scored a team-leading 10 touchdowns and ranks seventh among active FBS players in career rushing yards (3,432). Snell is the first player in program history to record three straight 1,000-yard seasons and is just the third player in SEC history to have 1,000 rushing yards and 10 rushing touchdowns in each of his first three seasons, joining Georgia’s Herschel Walker (1980-82) and Arkansas’ Darren McFadden (2005-07). At quarterback, the Wildcats are led by sophomore Terry Wilson, who has thrown for 1,214 yards and six touchdowns to go along with six interceptions this season. Wilson is also a threat in the ground game with 418 rushing yards and three rushing touchdowns.